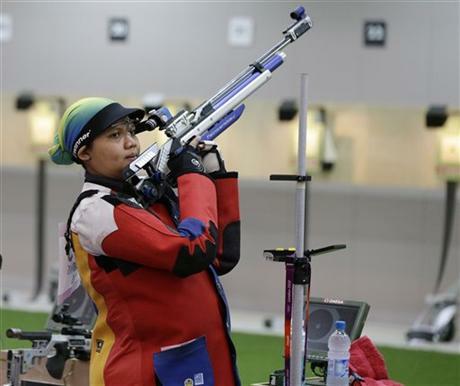 Nur Suryani Mohamad Taibi, a Malaysian mother-to-be, stayed positive despite failing to make it to the Olympic 10 m air rifle shooting final. Nur Suryani Mohamad Taibi, 29, who is 33 weeks pregnant, finished in 34th position out of 56 competitors. She is due to give birth on 13 September, but she said she felt four kicks during the competition but it did not put her off. “When she kicks I breathe in and out and then continue,” Nur Suryani Mohamad Taibi said. Nur Suryani Mohamad Taibi, who won a shooting gold at the 2010 Commonwealth Games and needed special permission to fly to London for the Games because she is so heavily pregnant, will be returning to Malaysia on 31 July. However, she described competing at the Royal Artillery Barracks as a dream come true and said she would carry on shooting after the birth. “I will still carry on because this is already my life,” she said. And she said perhaps her daughter could follow her into a sporting career. “My blood is like hers. Maybe she’s better than me,” she said.